Auckland's Queens Wharf was recently bought by the Auckland Regional Council and the NZ Government with a view to developing it into a public space and cruise ship terminal. It's also going to be a venue for events like Rally New Zealand in May 2010, and then for the main event -- the Rugby World Cup in 2011. If you're looking for cheap deals on New Zealand cruises head to http://cruisesalefinder.co.nz. Pictured is the Diamond Princess -- one of the largest cruise ships in the world and a regular visitor to the Port of Auckland. The 290 metre-long ship is only 38 metres shorter than Auckland’s Sky Tower. 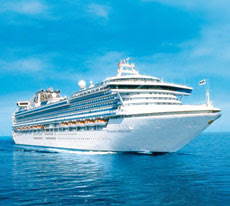 Her next departure from Auckland is 22/12/2009 for a 13-night Australia & New Zealand cruise -- and right now at Cruisesalefinder.co.nz you can save up to 27% off cabins. "Flashes of Sydney, London and volcanic Auckland are among the creative ideas to redevelop Queens Wharf for the 2011 Rugby World Cup. There's a giant ferris wheel to rival the London Eye, a row of giant sails resembling the Sydney Opera House, a series of volcanic cones or mountain peaks and a taniwha rising out of the Waitemata Harbour. The first stage of a design competition has attracted 232 entries from children to acclaimed architects. Later this month the entries will be whittled down to five designs and three team entries to find an overall winner. If you're looking for cheap deals on New Zealand cruises head to http://cruisesalefinder.co.nz.